Whoever you are. Where ever you are. Because you are alive. You matter. One of the core values of my personal faith is that in spite of our individual actions, beliefs, thoughts and feelings there is Someone Greater at work who declare's "You Matter." As apart of the New 2015 Canvas Corp Brands design team I was sent this card with some beautiful Tattered Angels Glimmer Mist Sprays. 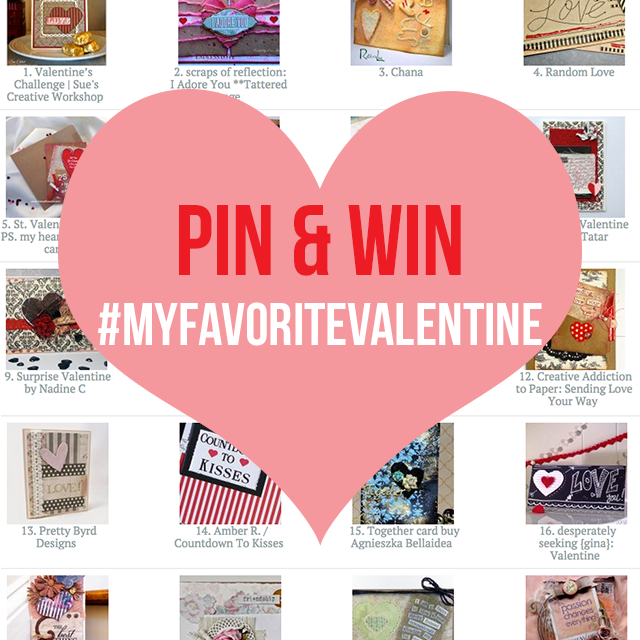 My first February challenge is to make a Valentine Card and give it away to someone who doesn't expect it. Now if you have read any of my posts since January, you know I'm all about Creating fearlessly yet I will be honest, I was quite intimidated by all the other design team examples. 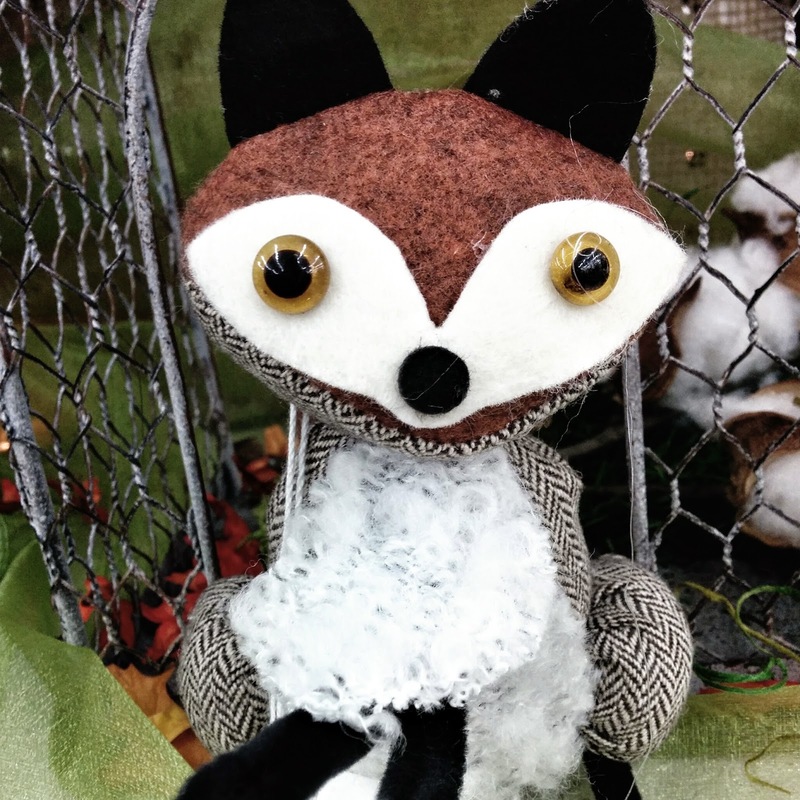 Canvas Corp Brands has recruited a huge team of seriously talented crafters and designers. I am blessed, excited and slightly overwhelmed at being apart if this incredible crowd. I had no idea how I could make my card pretty and yet stand out in a good way from the rest of the team. After several tries, in the end I just had to power forward and go with my gut. I tried to think of something that would be memorable. I met the recipient for my Valentine Card during the rush hour commute home. After a long day. And I'm starving. This is not wise. I don't recommend it. I do ridiculous things on an empty tummy, such as go grocery shopping and come home with a eighty dollars of snacks but not one thing I can use to make a meal for my family, unless you think M&M's and pretzels make a good dinner, then it's okay. Or instead I stop for a supremely not-quite healthy meal paid for using all the change on the bottom of my purse, because I'm thrifty like that. A couple of times on the drive, I've stopped at a local McDonald's. I was lured by the inexpensive three bite hamburgers and the One Dollar Diet Coke. Okay. It's only ONE DOLLAR! What diet coke addict can resist that? Anyway, a couple of times there has been a man in very well worn clothes that scream, "I sleep outside!" standing just at the corner of the restaurant holding a sign that says something about, "Spare change, anything helps." He is scraggly. He smells like wet pavement. He looks so sad, worn, and tired that it's hard to look him in they eye. I don't know his story. I don't know if he is just down on his luck, has a mental problem, or dresses this way for work- I could drive away. I think I might have driven past him many times. But twice I gave him my change and I grabbed his hand and prayed for him. Poor guy. I think I scared him. He jumped like I'd hit him with electricity. I should have asked his permission first but it is one of those times I just acted on impulse. In my head I am thinking, "My dollar in change is not going to help him. I should do something more." Prayer is the most powerful thing I have to give him. When this challenge came up, despite all the people I know, he was the first person I thought of. I need to find him again and give him this card. I need to get out of my car and talk to him. I want to grab his hand again and pray for him. I need to share this experience with my kids so that they can see, so they can know that this man with the hurt in his eyes - he matter's. He has value. So- for the month of February I will have this card in my car and stopping often at the McDonald's to see if he is there - I'm not sure he will be. I'm not sure when or if I will ever see him again. I am pretty sure he isn't used to crazy ladies in Mom van's slurping giant diet Cokes who want to pray with him. But, what can being nice to this stranger hurt? This is my year of living Fearlessly, living outside the box, learning new things and meeting new people. 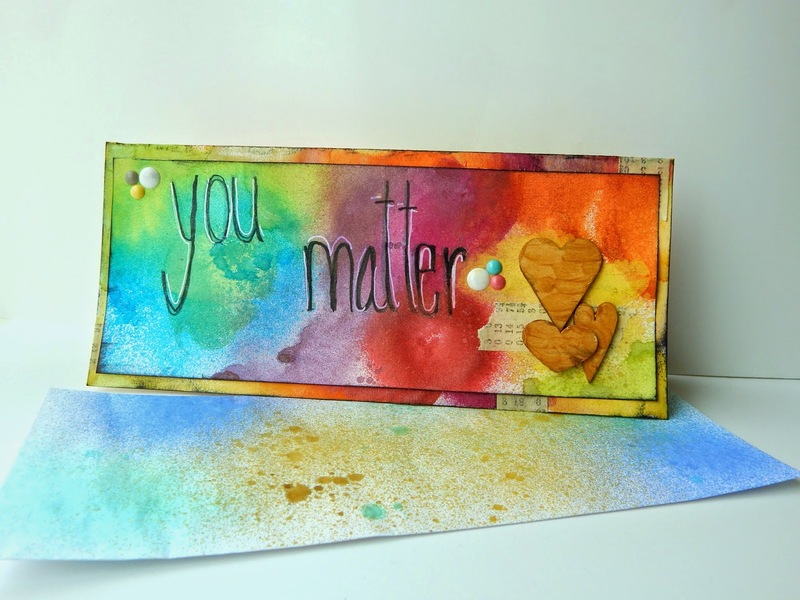 Can you think of a stranger who might be encouraged with a special card? Let me know in the comments if you give a card to someone who isn't expecting it - I'd love to hear about it. Keep checking the blog this month to see what happens- I will let you know. 3. Place a link to your pinboard in the Canvas Corp Brands Post Comments. February is the month of love and families are gearing up for hearts and candy. 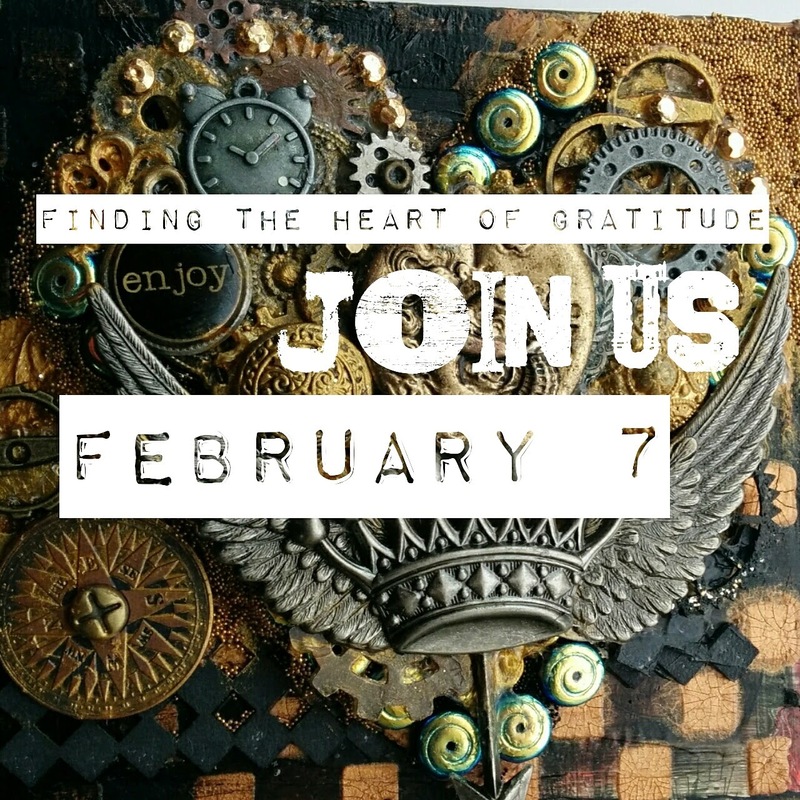 This year my friend, blogger Nancy Gaines of Domesticraft.com and I are going to change our thinking and go on a 21 day journey exploring the Heart of Gratitude in our lives and in our family's life. Join Us! There will be giveaways, art, laughter, glitter, paint and more! Keep an eye out for an Face Book event invite so you can be in on all the fun! I got tears! Is it any wonder that I love you! That was one of the most beautiful posts I've ever read! You are an amazing woman and I thank Allah (God) for bringing you into my life! We are good for each other! ♡ PS All your "The Heart of Gratitude Journey" promos look amazing! Super job! 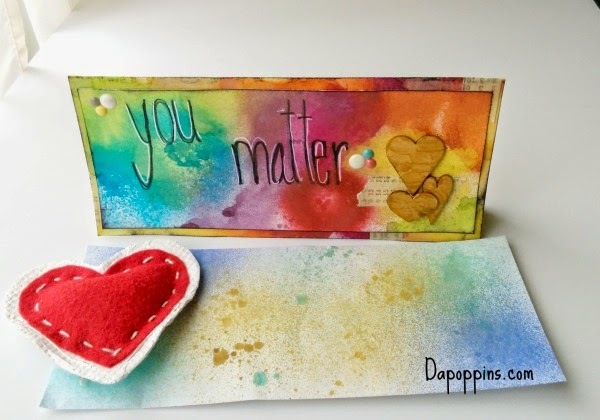 Beautiful card.You are so talented.This card reminds me of You Matter Monday on my tribe Brave Girls Club. I hope you write a follow up post for when you find the man and give him.the card. Love the awesome colors. Great technique and a wonderful design!